Mrs. Anna B. (Hovious) Perkins of Knifley, the daughter of the late J.B. and Flora Gertrude (Pike) Hovious, was born Sunday, July 15, 1928 in Adair County, KY and departed this life on Tuesday, December 4, 2018 in Campbellsville. She was 90 years, 4 months and 20 days of age. 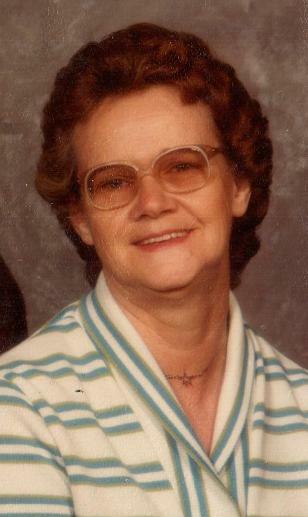 She had made a profession of faith in Christ and was a member of the Robinson Chapel Separate Baptist Church in Knifley and was a retired employee of Fruit of the Loom in Campbellsville and a homemaker. She enjoyed gardening, especially her flowers beds, and raised the prettiest lilies around. She united in marriage to Montie Perkins on April 7, 1947, who preceded her in death on June 23, 1986. She later united in marriage to L.J. Tucker, who preceded her in death on July 21, 2016. And a host of step-grandchildren, step-great grandchildren, nieces, nephews, and other relatives and friends. Besides her husbands, Mrs. Perkins was preceded in death by six siblings: Lucy Davis, Edna Wilson, Bonnie Pike, Audrey Loy, Wallace Hovious, and Dean Hovious; three half-siblings: Paul Hovious, Zelma Merritt, and Lois Crouch. The funeral service for Anna Berniece (Hovious) Perkins, will be Friday at 1:00 P.M. in the chapel of the L.R. Petty Funeral Home with burial to follow in the Campbellsville Memorial Gardens. Bro. Michael Woodrum will be officiating. Visitation will be after 10 AM Friday until time for the service. In lieu of flowers, please consider memorials in the form donations to Gideon Bibles or Hosparus of Green River. Those can be made in person at the funeral home, or online through the “How Can I Help” tab on the front page of this site.